Advocacy has remained part of ART's mission since its inception in 1979. The awareness and preservation of information in archival collections is the forefront of the organization as its members and activities continue to promote the professional and public importance of archival collections and practices. Advocacy is a critical topic in preserving archives as they continue to function as historic reminders of our history, activity, and knowledge, as well as celebrating those things. ART’s advocacy footprint can be explored on the current public advocacy page. My time exploring ART’s unique history has revealed its much more detailed and celebrated past in supporting archives across state and professional borders that I hope can expand its public footprint even more. I believe that promoting the understanding of archives is the first step in advocacy. The more we share the importance of archives, the more people we can unite to support them. Archives are the records of permanent value to interpret and preserve history to support the value of many organizations across government, education, businesses, communities, and people. Their significant value as an entity and profession is through the collective ownership of informational that acts as a documentary record for its past, present, and future users. As described by the committee, the Advocacy Committee aims to serve the archives association by, “reporting on local, state, national, and international issues that impact archives and archivists; supporting equality and diversity within the profession; and providing resources and knowledge that can be used to strengthen the archives community, its repositories, and the general public by keeping informed of policies and legislation that directly impact services and access to information.” It’s efforts not only support the activities of the members, but of other archival organizations as well. As I’ve explored the dynamic materials in the ART archives generously housed at the New York Philharmonic, I’ve discovered various advocacy efforts from ART and partner organizations that date back to the early 1980s. 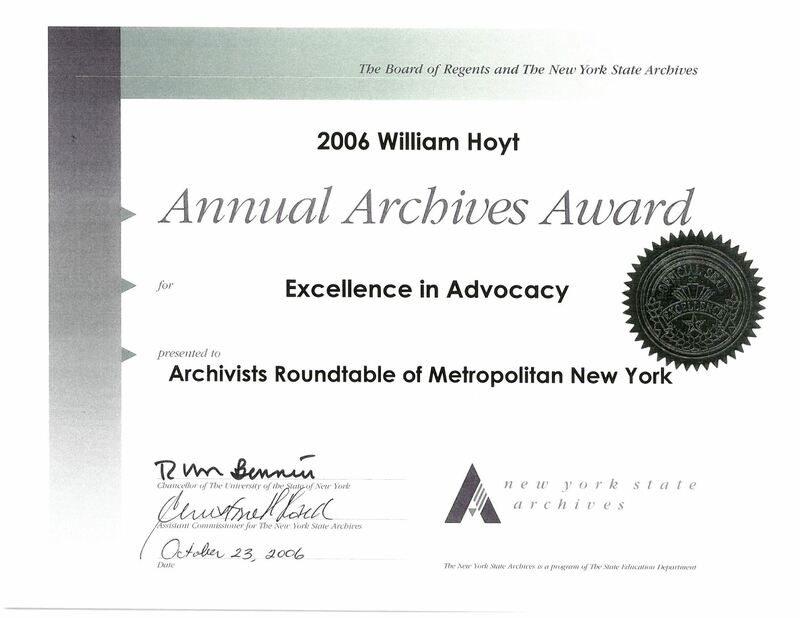 In 2006, ART was awarded the Annual Archives Award for Excellence in Advocacy that recognizes their efforts in the state of New York to promote responsible action in archival preservation. These efforts in advocacy exists in letters, workshops, emails, and events and mark important moments in the ART timeline as it continues to share and promote its mission of archival advocacy. This also proves that advocacy for archives and archival institutions never ends. There are always efforts to be made in improving the performance and exposure of archives and its professionals in order to improve the documentation of our history and act as responsible stewards of information. Even as the venerable members of ART have changed throughout the years, the unified voice for advocacy remains the same. Many records from the ART archives demonstrate the ongoing attention to local and national events, community engagement, and professional development that are involved in creating responsible advocacy efforts in archives. ART's partnership with other organizations generates a collective support for national archives and their responsible care including participating in the awareness of the funding, professional appointments, preservation care, disaster relief, and responsible disposal. Major events throughout ART's timeline have sparked new relationships with organizations, public leaders, local institutions, and members of government that continue to grow over time. As emerging and experienced leaders continue to learn about the important relationships between archives and history, the opportunity to create stronger advocacy will grow. Material highlights from the archives. 2016, Response Letter of Concern Regarding the Port of Los Angeles Archives from Eugene D. Seroka. 1999, Local Government Records Management Improvement Fund Informational flyer and support advocacy. 1999, Resolution in Support of the elimination of the sunset provision of the Local Government Records Management Improvement Fund (LGRMIF). 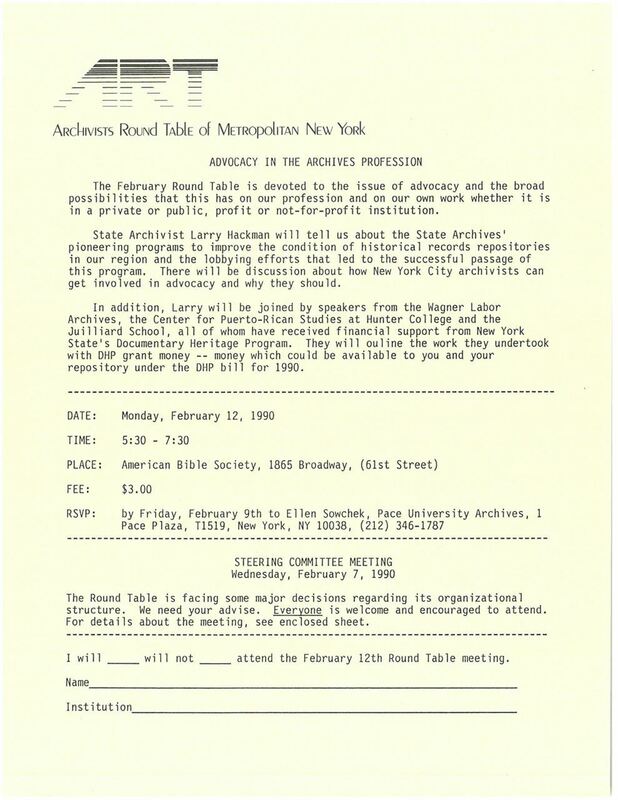 1990, New York Documentary Heritage Program Action call and fact sheet. 1990, Program with State Archivist Larry Hackman, February 12, 1990. Advocacy in the Archives Profession. 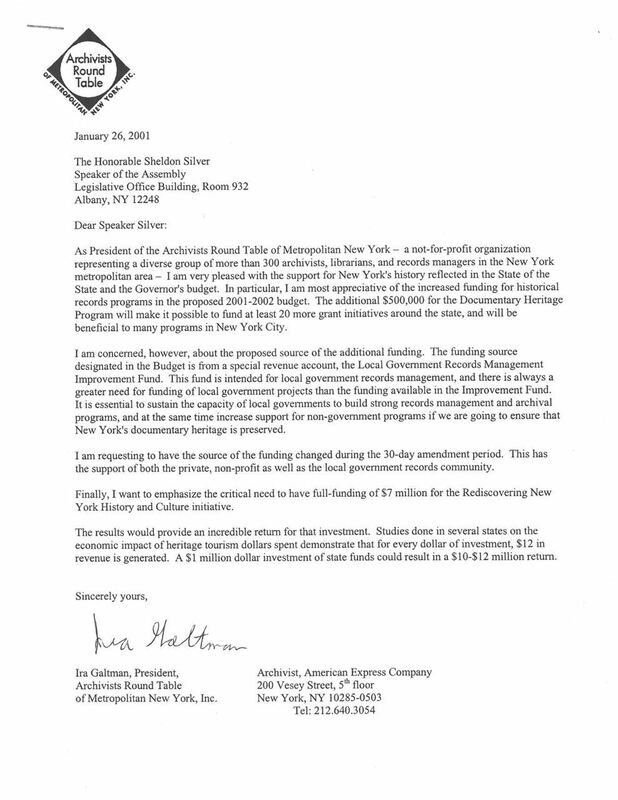 1993, Letter to Mayor-elect Giuliani on the role and support of the Department of Records and Information Services (DORIS) from the Archives Reference and Research Advisory Board. 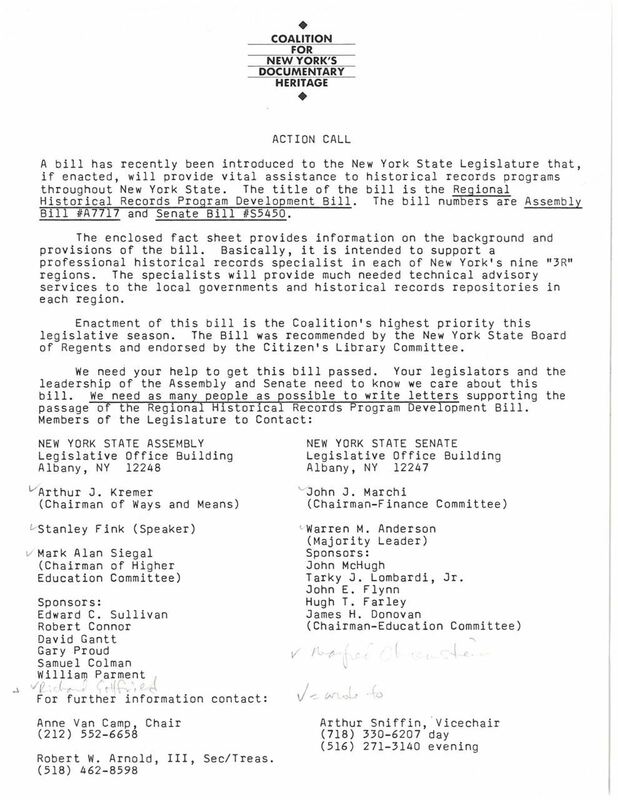 No date, Coalition for New York's Documentary Heritage, Action Call and Sample Letter to enact the Regional Historical Records Program Development Bill. 1986, Letter to Senator William V. Roth regarding President Reagan's inappropriate nomination of John Agresto for the position of Archivist of the United States. The New York Philharmonic archives have been led since 1984 by Archivist and Historian Barbara Haws who has also led the Archivists Round Table as President and was founder of ART’s annual New York Archives Week. Haws has continued to support the history of ART by overseeing its responsible storage and supporting my attendance at the New York Philharmonic’s archives during my twelve weeks to explore ART’s records and share its history. My experience exploring the archives left me more aware of the importance of archival efforts and the relationships it creates between individuals and organizations. ART's history responds to more than just archives, but important moments in our nation's history that have created major shifts in our culture. The collection of materials that make up this growing archive are a unique preservation of the narratives that came from influential members, individuals, and archival professionals during those moments in history. From my time in the archives, I've highlighted topics that I believe represent my most valued moments of discovery and provide a very brief overview of ART's dynamic history. Creating responsible support for advocacy. ART's abundant advocacy efforts have been part of its mission since its inception. Over time, advocacy within ART has grown in its local and national influence. Members of ART have contributed efforts related to preserving and funding archives and records, encouraging government action, supporting professional development, and sharing knowledge with the general public. Professional development in the many fields of archives and records management. ART frequently sponsors and co-sponsors professional development workshops and educational programs that focus on the topics of archives and records management. Topics from the decades of workshops include religious archives, documenting AIDS, disaster awareness, and archival activism. While there are many more topics that ART has contributed to through these programs, all of them have been part of a unique partnership with speakers, locations, and sponsors. Many of these programs and workshops introduced new topics surrounding current events and highlighted their unique history that has always existed in archives and the relevance to documenting heritage. 2004, Women's History Month Program, March 11, 2004. Activism in the Archives: Women's Collections at the Tamiment Library/Robert F. Wagner Labor Archives. 2004, USA PATRIOT Act Program with Columbia University Libraries, September 27, 2004. The USA PATRIOT Act: Implications for Librarians, Archivists and All Americans. Disaster relief and archival support. Following the events of 9/11, ART responded to the immediate need for records recovery and the long-term need to document the people, organizations, and activities that were affected by the attack at the Trade Center. The group leading this initiative with the Archivists Round Table aimed to work in cooperation with other regional, state, and national concerns with disaster relief and documentation. 2001, ART Board Meeting, October 23, 2001. New York's Archivists, Librarians, and Records Managers Respond to the World Trade Center Tragedy. 2001, Meeting at New York University, September 24, 2001. New York Archivists and Records Managers Meeting on Responding to the World Trade Center Disaster. 2002, September Meeting of the Archivists Round Table of Metropolitan New York, September 24, 2002. Archival Perspectives of Documenting the September 11th Tragedy. ART is thrilled to announce that archival material documenting the history of the organization will be processed this spring by our first intern, Leah Constantine. Our collection has been generously stored at the New York Philharmonic Archives for many years where it will be reviewed and documented by Leah over the course of three months. We look forward to her discoveries which will be shared through several posts on our site during the course of her work. Leah Constantine is currently pursuing her M.S. in Museums and Digital Culture at Pratt Institute with a certificate in Conservation and Digital Curation and is expected to complete her degree by May 2018. She also has a B.A. in Interdisciplinary Art and Design Studies from the University of North Texas that she completed in 2014. 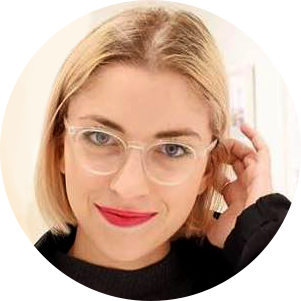 She is currently an Oral History Fellow at the New Museum and has experience with cataloging and preserving film collections, editing digital media and assets, and maintaining and creating web content and editorials. She also enjoys traveling with her dog, reading horror novels, and cooking.